Maxi Cosi AxissFix Car Seat is an i-Size Car Seat which has been rigorously tested. Long gone are the days of reaching and stretching over the car seat to fix it securely into place. The clever 360 degree swivelling seat allows parents to turn the AxissFix towards them. Why should I buy the Maxi Cosi AxissFix Car Seat? 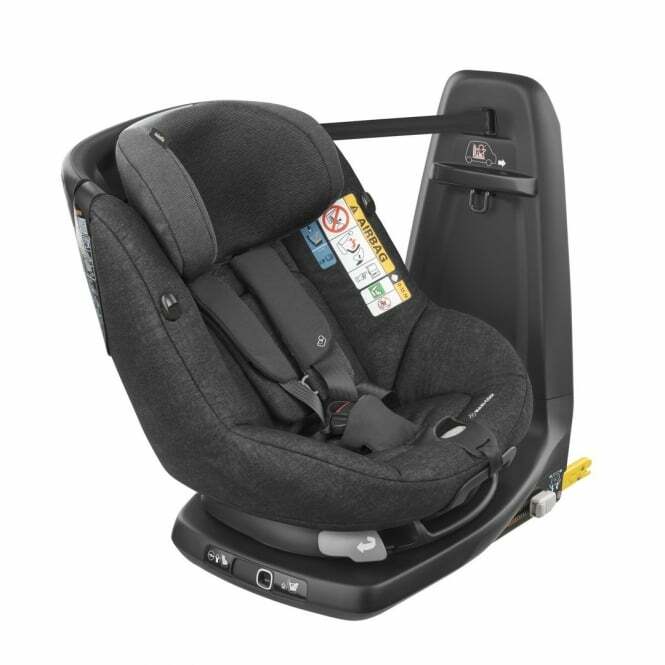 The Maxi Cosi AxissFix Car Seat is suitable from 61 – 105 cm (approx. 4 months to 4 years). This car seat allows your child to travel rearward facing for longer. Research shows that the optimum position of travel for babies and young children is rearward. So, this i-Size Car Seat provides rearward facing seat position until 87cm (approx. 2 years) making it one of the safest choices. The base can be angled to provide extra leg room. Once they exceed this height, it only takes a simple swivel to turn the seat around into the forward facing position, and off you go once more. In the unlikely event of a collision, the AxissFix provides excellent side protection for the head and neck. If Sapphire has a sudden growth spurt overnight, never fear because the Maxi Cosi AxissFix Car Seat has simultaneous harness and headrest adjustment. What’s more, the Maxi Cosi AxissFix Car Seat gives you the option to access your sleeping beauty from either side of your car due to the top tether straps. You can install your Maxi Cosi AxissFix Car Seat using your vehicle’s ISOfix connectors or with the car seat belt; colour indicators show whether the car seat has been fitted correctly. When your mini monsters are done with leaping, jumping and generally causing mayhem, you want them in the car and to be on your way as quickly as possible. The Maxi Cosi AxissFix Car Seat has harness strap hooks helping to keep the harness out of the way while you are securing Barney into place. Select from 4 recline positions to keep him as comfortable and happy as possible during that dreadful witching hour! This Maxi Cosi car seat complies with the i-Size European legislation (R129). i-Size provides extra protection in several ways, most notably by stating that babies must travel rearward-facing for at least the first 15 months. Huge steps were taken on the path of innovation of AxissFix to reach this high demanding i-Size safety level, without compromising on ease of use for parents, and comfort for the growing child. Last but not least, it's equipped with an ISOfix system with Top Tether for an easy and safe car seat installation in car. It provides the best side-impact protection, and is equipped with a high protective headrest with high performance impact-absorbing material. What are the specifications for Maxi Cosi AxissFix Car Seat? Suitable from approximately 4 months up to 4 years (maximum 19kg). Or from 61cm to 105cm. Do I get a warranty with the Maxi Cosi AxissFix Car Seat? Yes. If you register within 3 months of purchase, you can claim a Lifetime warranty. Applies to UK mainland only. 2 year warranty if lifetime warranty is not applicable. Is there a review for Maxi Cosi AxissFix Car Seat? *Please reference Maxi Cosi Car Fitting List to ensure that the product is suitable for your vehicle. Showing our 4 Maxi Cosi AxissFix Car Seat reviews with an average rating of Excellent. Would you like to write a review? We weren't sure that this car seat would fit in our as we only have a small car, but we were assured it would - and it does! Very impressed with its size however it is on the higher price scale of car seats. The features are great and very safe. Brilliant feature of switching sides for getting a child in and out which gave my back a rest! Once the seat was installed it was nothing to worry about, however this did take us a little bit of time to get right. The instructional videos did help a lot for this. As a parent, I wanted the safest car seat for my child. The Axissfix seemed to have everything I was looking for, plus it was available in plenty of colours. My daughter is quite fussy when getting into the car, but she adores the hearts in the pattern - a bonus to her safety! It's one of the safest seats that we could find online, and the reviews were outstanding. After purchase, it lived up to all expectations. It's secure, our child looks comfortable and it's easier that normal seats to get them in and out of the car. I'd 100% recommend to anyone.